Has anyone else seen this month's Food and Wine magazine (July 2009)? It is ridiculously good. I ripped out every other page to save in my 'Make As Soon As Possible' file. Recipes like Shrimp Stuffed Zucchini, Buttermilk Marinated Pork Chops, Grilled Apricot-Arugula-Goat Cheese salad. The one at the top of my pile is this perfect Mango Peach Sangria by Chef John Besh. 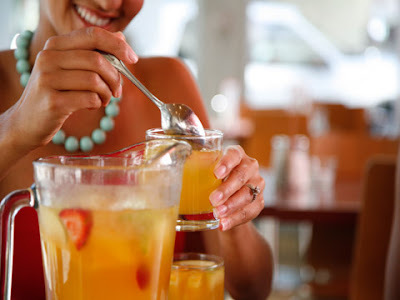 Mango Peach Sangria 1/3 cup sugar 1/3 cup water 1 cup Grand Marnier 1 bottle Viognier 1 mango, chopped 2 peaches, cut into thin wedges 1/4 cup mint In a saucepan, cook the sugar and water until the sugar dissolves; transfer to a pitcher and refrigerate until cold. Stir in the Grand Marnier, Viognier, mango, peaches and mint and serve over ice.